Boss lady: Maverick Farms director Hillary WilsonAs some of you may know, when I’m not scribbling away for Mother Jones, I help run a small farm and grassroots project in Valle Crucis, a small community in the Appalachian mountains just outside of Boone, North Carolina. You may be wondering what precisely the hell is Maverick Farms and what my role is there. Mainly, these days, I’m sort of the farm mule. I tend to our flock of 40 laying hens—let them out of their house in the morning, keep them fed and watered, etc. I do heavy lifting jobs, like moving vast piles of compost from one end of the field to the other in a wheel barrow. I help set up irrigation pipes when the rains don’t come; things like that. I also earn my keep in the kitchen, cooking most lunches and dinners during the growing season for a farm crew ranging in size from three to seven or eight, depending on what’s going on—a task which provides the fodder for my Tom’s Kitchen column. But now that I’m so busy writing, I’m no longer involved full-time in farm operations. 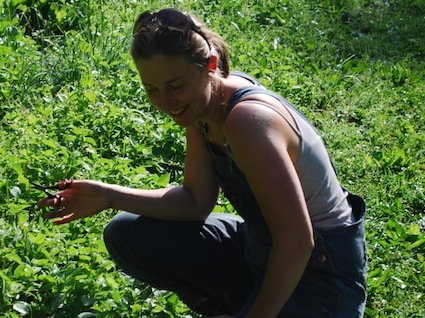 Like so much of the broader sustainable food movement, Maverick is pushed forward these days by a young woman: Hillary Wilson, 27, the daughter of the couple who started the farm in the early ’70s and the younger sister of my girlfriend, Alice Brooke Wilson. The three of us took over the farm in 2004, along with our friends Sara Safransky and Leo Gaev, and the project has evolved considerably over that time. 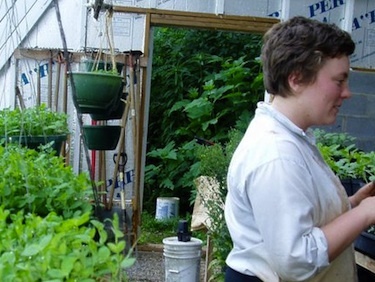 Rebecca Bilodeau, a 2011 farm hand, tends plants in the passive-solar greenhouse. Hillary grew up here and started working on the farm with her father Bill when she was 17—and from the start, she was the most experienced farmer among us, despite being the youngest by a decade. Hillary now oversees not only a 3-acre vegetable farm, but also the crazy projects I’ll get to below. I’m kind of her consigliere these days; she’s the boss. When we first launched, we knew we never wanted to be a niche operation selling to the high-end country club and resort restaurants that dot the area, which is a magnet for vacation homes for people who live in the hotter regions to the south and east. The idea of growing for a small elite while most people who live here year-round rely on fast-food chains and multinational grocery giants for food never appealed to us. We wanted to work on the ground to build an alternative food system that works for everyone. So from day one, we saw the farm as a laboratory for finding solutions to what I see is the main riddle facing the sustainable food movement: how to expand access to healthy food in a way that works for farmers. The laboratory has had its share of spectacular near misses, like the major effort our first several years to transform the farmhouse into a restaurant one weekend each month. It was fun to play chef and come up with elaborate menus, but we realized that unless we were willing to charge exclusive prices, the dinners took up too much time to justify the money they brought in. 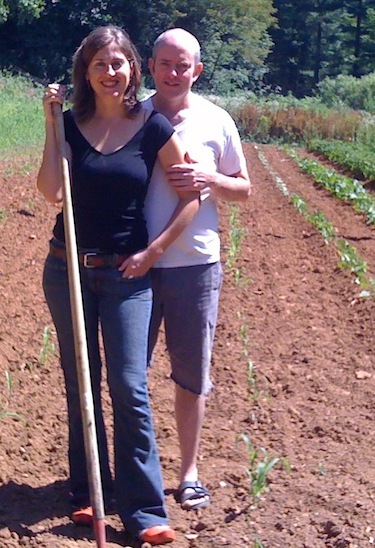 Alice Brooke Wilson and me, in the early-season corn patch. Over the years, we’ve concluded that the task of creating an accessible alternative food system is really about community building—about working with other farmers and with the broader community to create new economic models. 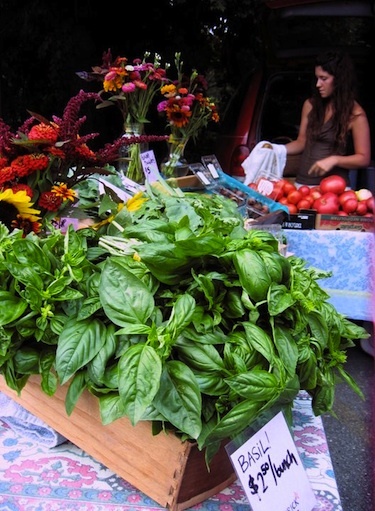 In 2009, after four years of running a small CSA on our own, we launched High Country CSA, a multi-farm year-round CSA project designed to help stabilize the market for locally produced food and take advantage of our region’s particular mountainous geography. In the three counties that surround us, elevations range from 1000 feet to 3500 feet above sea level (we’re at about 2800 feet). As a result, the area has a stunning diversity of microclimates, long winters, and mostly small farms (in the 1-3 acre range). The multi-farm CSA model gives our community a robust institution that delivers a variety of high-quality food even under challenging growing conditions. And it’s not just for people who can afford a big upfront payment for the season’s produce. We invite people to pay for their shares in installments throughout the season, and in 2010, after a slog through the USDA’s byzantine bureaucracy, we became one of the few multi-farm CSAs in the nation that can accept SNAP/EBT payments (ie, food stamps). As far as we have been able to find out, we are the only rural multi-farm CSA that takes EBT—although we would love to find out otherwise. With the multi-farm CSA up and running, we’re embarking on our next project: a farm incubator program, in collaboration with Appalachian State University, which has vacated a 13-acre educational farm a couple miles away. In our community, as in most of the nation, the only way we’re going to create a food system that makes sense is to get more smart young people on the land. Hence, what we’re calling FIG—the Farm Incubator and Grower Program. The new incubator will create an “agricultural commons” to give landless farmers access to land and equipment to start new farm businesses, and will help link them to affordable land once they’re ready. Hillary is a natural to lead the incubator—she’s been teaching novices how to farm since I showed up here nearly eight years ago, when my entire growing experience involved a rather weedy eight-square-foot community-garden bed in Brooklyn. She’s also worked closely with the dozens of young interns who have moved through Maverick over the years, eager to get experience working the land. Kaitlin Melvin, the other 2011 farm hand, tends our farmers market stand in Boone. So that’s pretty much what we’re up to here at Maverick Farms—that and eating well. For Thanksgiving, one of our star former interns, Hana Crouch, is coming over to cook a turkey that she raised and slaughtered (and that I have requested that she dry-brine). I’ll be making those side dishes I wrote about a few days ago, along with a classic apple pie. We’ll have some friends and family over, and we’ll cook and laugh and drink and enjoy this most unlikely holidays in our fast-food nation: a day to celebrate food, the land it came from, and the people who grew it. How Green Is Your Thanksgiving Menu?